Being a part of social networking websites means you can follow our development in different formats and mediums. This page will connect you quickly to our external networks, you can also follow our Blog and Newsletters on this website. 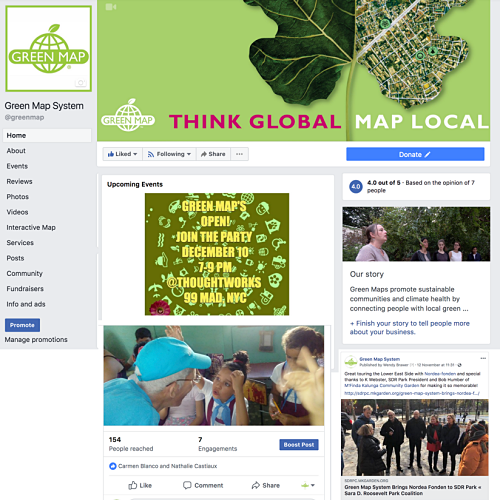 Check our Profile at facebook.com/greenmap. Search for Green Map to follow local Green Map projects, too. What is Green Map System doing now? Now we have over 5,000 followers on Twitter. Like to watch videos? Green Map System has a YouTube Channel for our own videos and those created by local Mapmakers, all on the same page. Ours has been one of the top viewed nonprofit channels! Stay tuned at @greenmapsystem. We encourage you to join this online community platform and share your photos of Green Map events, workshops, green sites, etc. Include in your picture the tag "greenmap" so everyone can find it (find more hints here). Green Map System created a resiliency promotion call #animatechange in 2018 - check it out at giphy.com/greenmap! Someday, we will be more active on Pinterest and Instagram.